I had the first Microsoft Band from the day of first release and then when my Band broke for a 2nd time I got a Microsoft Band 2. I use Band for three things: Tracking walking, as a watch and notifications from my phone. I also find some of the other features like UV tracking helpful. 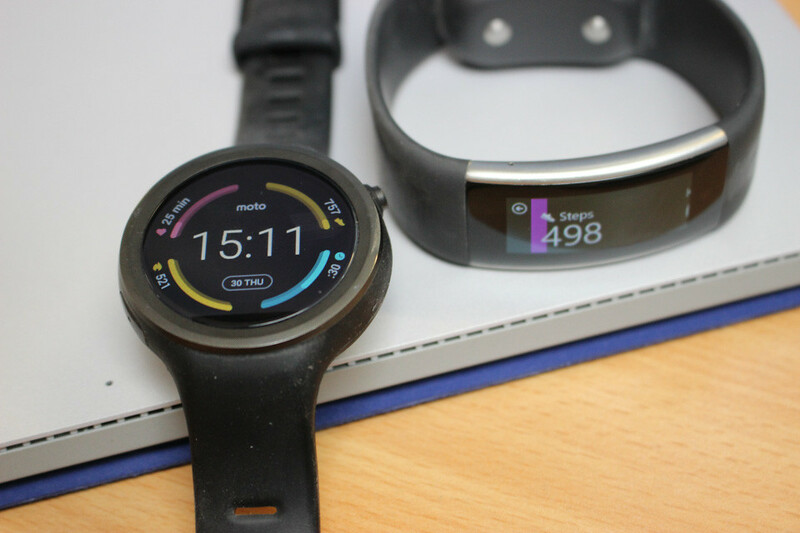 Now that I have switched to running Android I thought I would see how Android Wear Google’s OS for wearables compared to Microsoft device so I picked up a Moto 360 Sport (both are around the same price £149). Granted the Microsoft Band is a fitness device with notification and Android Wear is a platform with fitness features there is a lot of cross over and for Microsoft to compete in wearables I think a 3rd gen devices needs a lot more feature. At first glance this may seem a trivial feature but being able to pick and choose between the plethora of watch faces available in the Google Play Store makes the watch more personal plus you can select a face that fits your needs. If you are interesting in weather there a ton of faces that give you glanceable weather information or if you want multiple time zones you can have a face for that. There are faces for launching apps, elegant clear displays, retro faces, fun faces, fitness faces or whatever you want. Many faces have interchangeable widgets on them (I think the correct term is complications) so you can select dials like battery life, step count or weather. The Microsoft Band is just a simple clock display and while the form factor doesn’t lend itself to watch faces it would be nice if it supported a portrait clock mode and not just landscape it currently offers. Even the option of changing of fonts would be nice. The main difference between the platforms is the ability for Android Wear to run apps. You can have things like Google Maps on it so while you are walking you can see where you need to go without getting your phone out. An app like TripIt can displays your next flight, you can read news headlines via an RSS reader or the BBC News app. You can create notes in OneNote or Google Keep, Find your car, checkin on Swarm the list goes on and on. 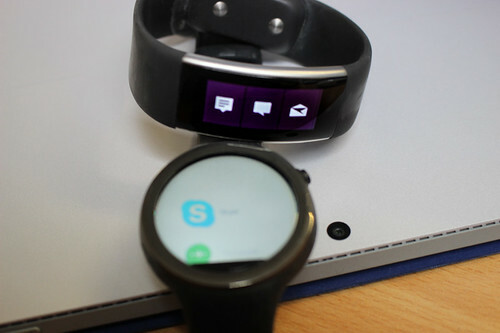 The Microsoft Band has built-in apps and developers can create tiles but they are not really fully fledged apps. On the Microsoft Band you get notifications for Email, Twitter, Facebook, text messages and phone calls but you can’t get the full text, the form factor doesn’t really allow for that anyway but it does mean you have to get your phone out if you need to read the full text of a tweet or email. The larger screen of Android Wear means you can read full email with the Outlook or Gmail app and you can reply, flag or delete emails making it great for keeping up with your email. I find being able to flag emails from the watch really handy. The same for Facebook and Twitter notifications. On Android Wear notification that you dismiss are dismissed on the phone whereas on the Microsoft Band dismissing notification has no effect on the phone so I would like to see two way notifications on the next Band. Android Wear devices can have on board storage so on the Moto 360 for example I can transfer music to the device and listen to it via a Bluetooth headset. While I don’t use it that often that with the built in wifi means you don’t have to carry a phone around all the time. Nothing like this is possible on the Microsoft Band, but you can control music playback from the Band as you can on Android Wear. The Moto 360 and Microsoft Band record steps and heat rate so you can get the same kinds of reports with both systems. I find the Microsoft Health app better than the Google Fit app it seems easier to use and understand the data but that could be because I have spent more time with Microsoft’s app. 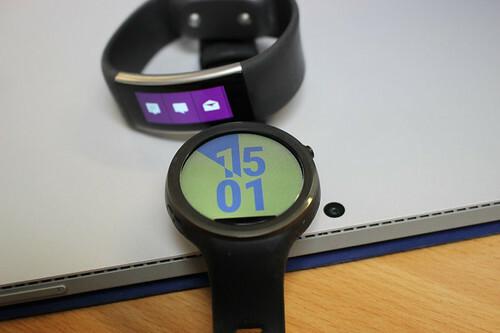 What I would like to see is Microsoft Health working Android Wear devices. Microsoft’s Band has a UV sensor on it so it can tell you when you have enough Sun, it measures the UV levels and warns you if you are going to get bunt. 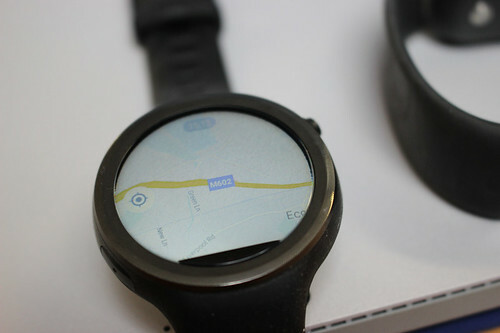 The Moto 360 doesn’t have that feature. So for the 3rd generation Microsoft Band I would like to see a larger customisable display so you can display the time however you want. I would like to see true 3rd party apps which would be more than just notification tiles and which have two way notification. In fact what I really want is a Microsoft Wearable running UWP apps. In fairness the Microsoft Band is probably more for fitness enthusiasts whereas the Android Wear is more of a computing device. If you are an Android or iOS user there are lots of options on the wearables front whereas with Windows 10 Mobile there is only really Microsoft’s products. In fact the Microsoft Health app runs on iOS, Android and Windows so one of the few true cross platform systems. Wearables is in its infancy at the moment and as the hardware improves more we will see better battery life and more features, I would really like to see a more advanced Microsoft device to compete with Apple’s WatchOS and Google’s Android Wear. Agree or disagree leave a comment!